This cool treat may transport you. Milkshakes first entered the American diet in the 1880s, but what was considered a milkshake then and now is completely different. Milkshakes began to take the modern form that we now know and love in the 1920s, thanks to the invention of the electric blender. By the 1950s, milkshakes, along with a hamburger and fries, were equated with wholesome goodness. Milkshakes are as popular today as they ever were. Not surprisingly, the ones I consider to be the best are at establishments that remind me of the past. Sun Studio is primarily a tourist attraction due to the magic that has transpired inside the recording studio over the years. Before you get to the studio, though, there's a small café and shop. It has a definite rockabilly vibe, and electricity is most certainly in the air. There's also a sense that anything could happen at Sun Studio — a celebrity could walk in any minute or you could meet the man (or woman) of your dreams who just happened to be visiting from somewhere far, far away, like Denmark. They offer studio tours, sell memorabilia and merchandise, and make a damn fine milkshake. Each one is made-to-order and comes in your choice of chocolate, vanilla, or strawberry. The ingredients are nothing special — ice cream, syrup, and milk — but they combine to form a perfectly thick, yet totally sippable treat. Have one and you'll not only feel but look cool. Sweden Kream is off the beaten path in North Memphis but well worth the journey. It's a small, freestanding building where you can order at one of two windows. There's a little bit of everything at Sweden Kream — shakes, malts, Hawaiian ice, breakfast foods, hot wings, and even peanut butter and jelly sandwiches. There's a very wide variety of shake flavors, but I highly recommend the peanut butter banana. They come in three sizes — medium, large, and jumbo — and are served in styrofoam cups. They are deliciously thick and creamy. A very small dining room has been added on one side of the building, and if you get lucky, you might get a front-row seat as you watch the girls in the hut quickly and expertly mix your desired ingredients. Even when it's 60 degrees outside, it's absolutely sweltering inside Sweden Kream — no doubt due to the griddle. (The awe-inspiring hamburgers are the perfect companion to your shake.) My server wore a tank top, basketball shorts, a hairnet, and an iPod. She danced as she filled orders, and I got the distinct feeling I was watching the star of a spunky, working-class tale like Roller Boogie or Breakin' do her day job. 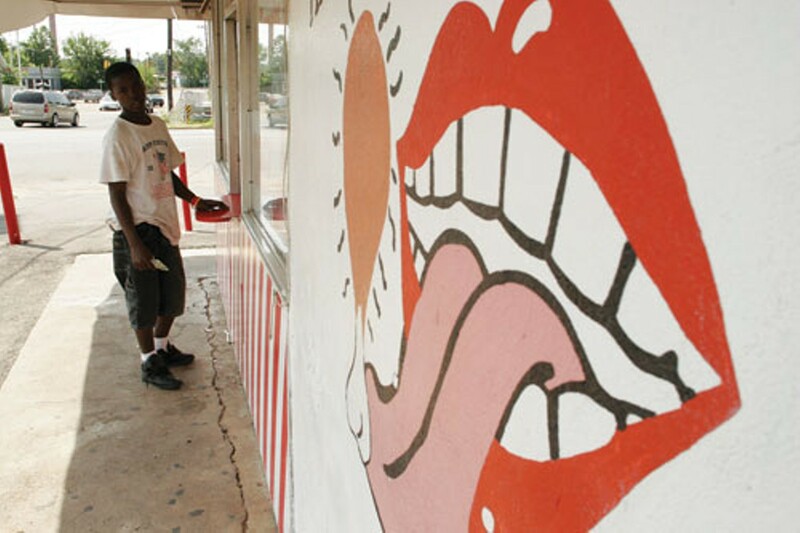 Ask any Midtowner where the best milkshake in town is, and they are likely to say Wiles-Smith Drug Store. It's hard to resist the charm of this lone independent pharmacy with its old-school soda fountain and authentic retro stylings. No credit cards or checks are accepted, and there's no big-screen TV on the wall. (You can, however, hear Prince on the radio if you're lucky.) In terms of seating options, there are chrome barstools at the counter and several sparkly yellow vinyl booths to choose from. Prominently displayed behind the counter is a shining stainless-steel milkshake mixing machine. The milkshakes come in four flavors — chocolate, vanilla, strawberry, and cherry. Each one comes out nice and frosty in the metal canister it was blended in and is enough for two (or more) people to share. It's not too thick but not too thin. A layer of frothy bubbles lines the top and tickles your mouth on the way down. It's incredibly hard not to make "yummy" noises after your first sip.